These beautiful flowers are very popular because of its simplicity and long abundant flowering. Annual asters are grown in two ways: seedlings and, consequently, nonseedlings. Each of them has its pros and cons. Sowing seeds for seedlings should begin from mid-March to early April. Prepare a planting material, for this purpose it is necessary to pre-soak in a growth stimulator. Dissolve the drug in accordance with the instructions. Seeds lay on marlechku, cover them with the cloth and pour the solution. Hold them during the day. Then dry. Prepare the soil for planting seedlings. The simplest way to use a universal primer, but you can make the soil mix yourself. To do this, take 2 parts leaf humus, add 1 part peat and a little sand or vermiculite to the looseness of the substrate. Pour the soil into the plastic container. The surface is smooth, place on prepared seeds of asters and sprinkle a layer of soil 0.5 cm. Cover the container with film and leave in a warm Sunny place. The first shoots expect in 3-5 days. Film with this makeshift greenhouse daily wipe, because it accumulates condensation. Planted in open ground to a permanent place in mid-may. A couple of months Astra, planted thus, you will appreciate the lush blooms. When the seedlings appear 2-3 true leaves, they will need to dive into individual cups. It is less time consuming than seedling method, so many growers are recommended to grow asters just that, to plant the plants directly into the open ground to a permanent place. This can be done both in spring and autumn. For autumn sowing prepare a place for astr in advance. Dig a flower bed, remove the roots of weeds and make the complex mineral fertilizer and humus. Begin to sow the seeds of astr from the beginning of October and until frost. Make the grooves, lay them in planting material, and the top sprinkle with humus. In the spring when Aster goes to growth and will see the first true leaf, seedlings to thin out. Care seedlings is watering, weeding and hoeing. Similarly, you can plant asters in the spring. Prepare the soil and wisata pre-soaked in the stimulant seeds. Then pour the furrows, cover the planting of non-woven covering materials and wait for germination. 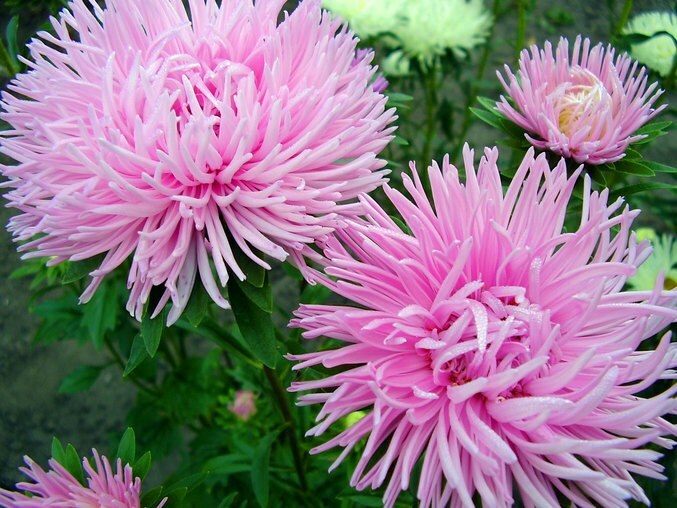 Flowering asters, planted directly outdoors in the spring, will occur in early to mid-September. If you want gorgeous asters in your yard are in bloom from mid-summer to late autumn, plant them and seedlings and nonseedlings way.